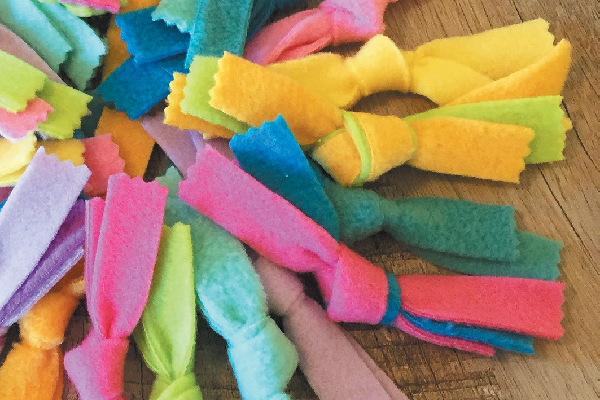 If you always have a lot of fleece lying around like me, here’s a fun way to use up some of the scraps — making cat toys! 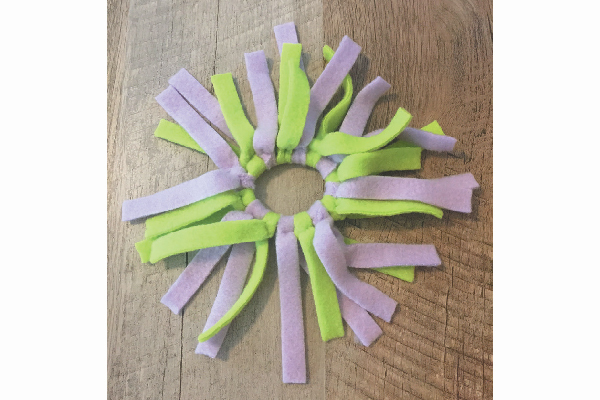 These fleece toys super easy to make, and my cats love batting them around the house. Cut the fleece into 1-inch-wide strips; the length of the strips can vary, but I’ve found that they’re easier to work with if they’re about 8 to 10 inches long. 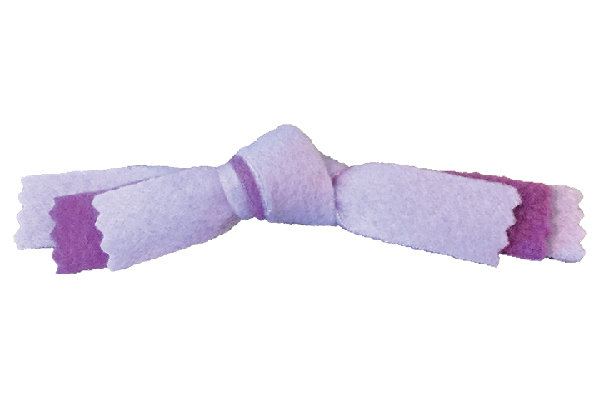 Take two or three strips, and tie them into a single knot. Trim the edges so the fleece is even on both sides. I also like to trim the edges with pinking shears to give them a more finished look. Cut the fleece into strips that are 1/2-inch wide and about 4 inches long. Tie the strips all the way around the hair band. I was able to get about 15 to 16 strips around a medium-size hair band. Tie the strips in a double knot so they stay on. If the strips are too long, you can trim them down to whatever length you’d like. Safety tip: If your cat is a toy destroyer, supervise her when she’s playing with this toy. You don’t want her to rip off the fleece and swallow it or the hair band. Tell us: Would you ever make these fleece toys for your cats? What types of toys do your cats love? my cats didn’t like these toys. I was kind of expecting as much. They are lazy hogs! Love this tip. Thank you . I’ve done the first one but added catnip into the knot. The kitties loved it, especially if they could eventually get it open and gorge themselves.